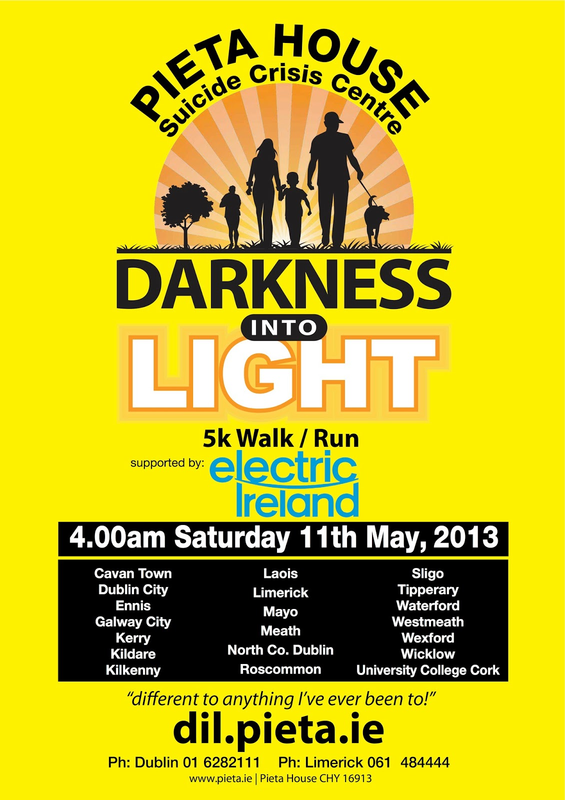 At 4.00 on the morning of May 11 in 20 centres around Ireland people gathered for the Pieta House 'Darkness Into Light' run-walk in aid of the charity that helps those who are suicidal and seeks to prevent suicide happening. Left Shankill at 3.15am in the rain and couldn't believe the traffic as I came near Donabate - it took 15 mins to cover last 5km. A great crowd. We were part of something very special. Down in Roscommon my cousin Janette was walking with her husband Kevin. Neighbours from Mervue were walking in Galway. 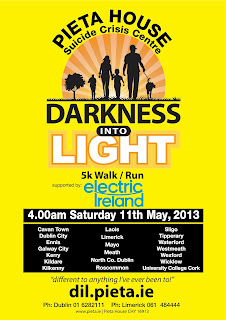 I did this especially in memory of one relative of mine who took his own life, for another who tried and also as a prayer for anyone thinking of suicide, for the families affected by its terrible pain, for all of us who struggle with darkness or depression. I was alone in this great movement of people. Alone but connected. Not at all lonely. My aloneness gave me time to ponder, pray and listen - listen to the constant chatter and laughter - and I wondered at times do people talk and laugh so much in order to keep the darkness at bay. If it succeeds in doing that then, I suppose it's ok. I listened also to the silence above and at 4.35 heard the first bird. It was a robin singing strong, clear, confident and it seemed that creation itself was drawing our attention upwards, seeking to uplift us. 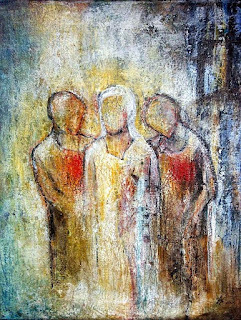 All this movement seemed appropriate as we neared the celebration of the Ascension of Jesus, an event that draws our gaze upwards, that raises our hearts from being downcast to being uplifted. Jesus walks with us from darkness into light, from night into day. We are called to keep our attention focused on Him and in Him to find meaning where there seems to be none. It's a movement that we can choose to be part of but it's a choice that only we can make for ourselves. We have to make the choice. I have to make it. But when you're depressed you also need help in coming to that choice. It's sometimes said of someone who has committed suicide - "if only he had talked" but often talking isn't enough. Sometimes talking is impossible. What we as Christians are called to is to create a society in which the light is visible, to create an atmosphere of hope rather than despair. This is made possible by our own personal experience of Jesus, an experience in which we are so connected to Him that we move with Him. Jesus was on His knees in the dark agony of Gethsemane. He died and went down into the deeper darkness of the tomb. But He emerged from that darkness in the resurrection and now in the Ascension He is lifted up to the highest heights. That's the direction our Christian society should be taking but now it would seem we have gone into reverse and we are stuck in a mud of negativity that robs us of life. We turn wine back into water, resurrection back into death, light back into darkness. Much of the media promotes this reverse and we allow ourselves to be taken back into the dark. Because of my tendency towards depression and my struggle with it I made a choice some years ago to keep up with the news but not to read or listen any more to the endless negative interpretations that have the effect of making us feel hopeless and powerless. And I deliberately look for the light and the hope that lifts me up and that makes it possible for me to be an instrument of hope, peace, light.